1975 - A powerful storm brought high winds across Lower Michigan, toppling trees and power lines. A tornado was spun up by the storm, damaging mobile homes and a barn in Allegan County. The Edmund Fitzgerald sank in Lake Superior during the storm, with a crew of 29 men. There were no survivors. 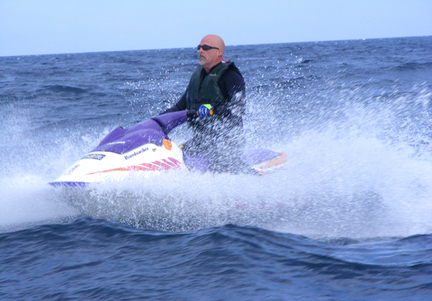 MUSKEGON â€” Hank Carpenter rode his personal watercraft across Lake Michigan last weekend, all in the name of adventure and generating awareness for a disease. Don Pietrykowski has been selling boats at McMachen Marine in Harrison Township for the past 15 years and is the first to acknowledge times aren't the best. However, he's excited to be at the 39th annual Metro Beach Boat Show and his hopes are high for the show, which runs through Sunday. Where is your favorite spot in Michigan for the fall colors? Despite the slow economy, organizers of the 30th annual Michigan City In-Water Boat Show say the event fared well last weekend.